Teapots found in a jar. Ceramics represented most of the cargo found on the site. Surprisingly, the ship seems to have had only ninety centimetres of ceramics (heavy cargo) in her hold - a rather small percentage of the ship's cargo capacity, inferred from her length, beam and profile. Perishable items loaded on top are likely to have been relatively light, and the ship would have been sailing with a rather shallow draft. All of the ceramics on board were of Chinese origin. They included different types of Yixing ware made in Jiangsu province, blue-and-white porcelain from the famous Jingdezhen kilns in Jiangxi province, and simpler porcelain from the Dehua kilns in Fujian province. 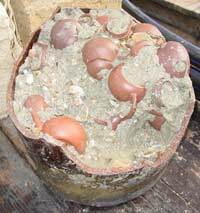 There are also large brown-glazed stoneware jars of uncertain provenance - attributed by Professor Zhang Pusheng to south China(1), but of a gritty clay identical to that used in the Shanghai jars, which were almost certainly made at the Suzhou kilns in Jiangsu province(2). The jars were used to store smaller wares available in the region of Suzhou, so it is possible that these storage jars were made in the same area. 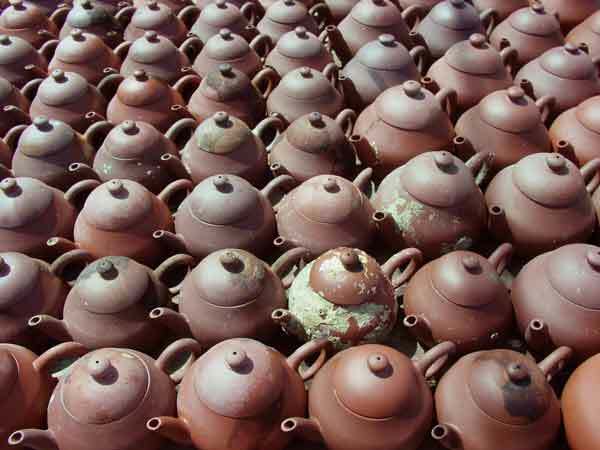 Yixing wares including teapots, covered boxes, brown-glazed bowls and water pots were stored inside the same type of storage jars, and are likely to have been loaded in the port of Hangzhou or nearby Shanghai. All blue-and-white porcelain was found stacked into separate cargo compartments, and is likely to have been taken on board at the same time. The Dehua wares, also stacked in separate, smaller compartments, are likely to have been loaded in the port of Quanzhou. Large numbers of brown-glazed basins, found in nested sets of three or four, were probably made in Guangdong province, and this is likely to have been the ship's final stop in China. Pictures and quantities of each type of ceramic artefact are on the next page, following the general description of the cargo below. Yixing is most famous for its teapots, but the Yixing repertoire includes other handmade products. Yixing wares are characterized by fine porous clay, and made from a flat base and a rectangular side piece, assembled by hand into an approximate form, and beaten into the final desired shape. Yixing teapots are made from clays of different colours varying from green, red and red-brown to dark-brown. These were mixed in secret proportions before the clay was left for curing. 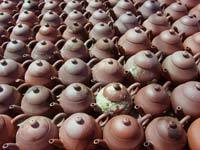 Yixing teapots are fired at 1200 degrees centigrade, and considered to be stoneware(3). The porous nature of Yixing clay allows the flavour from tea to accumulate, thereby seasoning a teapot and eventually giving it a 'shine' much appreciated by tea lovers. The final colour, shape and resonance made some teapot-masters famous. All of the different colours are represented in the Yixing teapots from the Desaru ship. The teapots are in four sizes, ranging in height from six to eleven centimetres. All but two teapots bear their potter's chop (seal, stamped or handmade). Thirty-six different marks were recorded among the hundreds of teapots, making a remarkable collection of contemporary styles and marks. The most famous mark is that of Hui Mengchen, who was active in the 17th century but apocryphal marks and chops appeared for centuries thereafter(4). Six different Hui Mengchen marks (handmade or stamped) were found among the Desaru teapots, confirming that these marks were being copied at the same period. Other famous potters represented (or misrepresented) are Wang Youlan (active 1644-1722), Yang Youlan (active in the 18th century), and Shao Youlan (recruited by the court to Beijing during the Daoguang reign, 1821-1850)(5). There were a number of teapots on the Desaru ship with the mark of Shao Youlan. Other Yixing wares from the Desaru ship include brown-glazed bowls made from a white and porous Yixing clay. More unusual are Yixing covered boxes, found in three nesting sizes. These boxes, packed in set of four, were also found inside the large storage jars. The box shapes copy those of Jun wares from the Song dynasty(1). These boxes were once green-glazed, but many were black at the time of recovery, due to oxidation. Other Yixing wares include black, blue and green-glazed chamber pots. Brown-glazed wares include cylindrical jars with large diameter mouth-rings. The jars were made from a rather coarse dark-red to brown clay, and ranged from fifteen to forty-nine centimetres in height. A simple carved pattern was incised vertically and horizontally on the shoulders and upper body. These jars were the most voluminous cargo on the Desaru ship. Other glazed wares included black and brown-glazed basins. Black-glazed pots were made from fine clay with a rounded mouth-ring. The glaze sometimes appears blue. Brown-glazed pots were made from coarser clay and finished with a flattish mouth-rim. These pots were decorated with stamped motifs all around the lower body. A few of over 50,000 spoons. 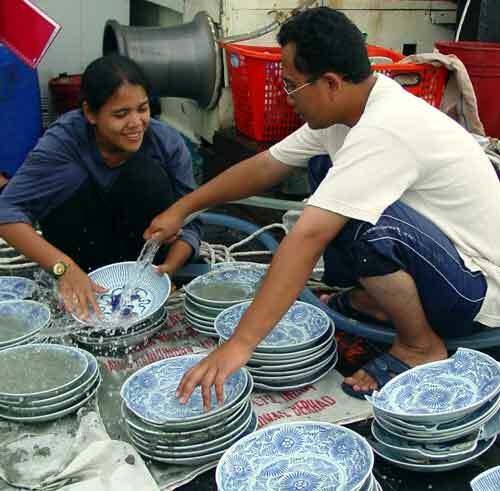 The Desaru cargo included various types of Chinese blue-and-white porcelain. Blue and white spoons were most numerous; more than 50,000 pieces were found. 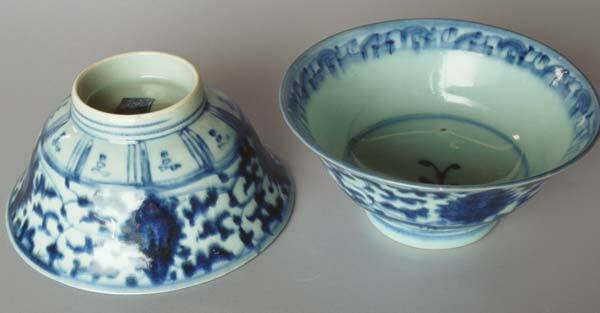 Blue and white flower bowls from the Jingdezhen kilns represented the second largest quantity. These bowls are decorated with a flower motif on the exterior and a fungus in the well. The application of cobalt blue in these bowls was made on a rather wet pot, resulting in a diffuse motif. Other blue and white ware from Jingdezhen included large flower dishes, flower plates, covered wine bowls, and Kamcheng jars decorated with pea blossoms. Another bowl from Jingdezhen was covered on the inside with a transparent glaze while the outside was celadon-glazed. The country ship Diana, sunk off Melaka in 1817, had similar flower dishes on board. The Chinese junk Tek Sing, sunk in Indonesia in 1822, carried other porcelain wares and Yixing teapots identical to those on the Desaru ship. Areas outside the hull were left unexcavated. From the excavated area, 11,875kg of broken pottery was recovered, separated by type, weighed, and converted into an approximate number of whole pieces in order to give an indication of the original cargo. The results of this analysis are shown on the left. Adding the broken pieces to the intact and semi-intact artefacts, a total 32,371 kg of ceramics was recovered from within the outline of the ship. 63,341 intact or partly-broken (substantial portion) ceramic artefacts were recovered. After adding substantially broken pottery, shards and fragments, converted into an approximate number of intact pieces, the ceramics recovered are equivalent to 69,726 pieces. See next page for the quantities and types of ceramics found. Personal correspondence 15 Jul 2001 with Professor Zhang Pusheng, Research Institute of Chinese Pottery & Porcelain, Professor of Nanjing Museum & Fudan University. Barbara Harrisson, Later ceramics in Southeast Asia, sixteenth to twentieth centuries, Oxford University Press, Kuala Lumpur, 1995, plate 54. Professor Bo Gyllensvard, 1990, Porslinet fran Kima, Vasteras, Sweden, p.140-3. ISBN 91-534-1220-6. Peter Lam, e-mail, 11 Oct 2001. K.S.Lo, The stonewares of Yixing, from the Ming period to the present day, Hong Kong: Sotheby's Publications, Hong Kong University Press, 1986, p.261-282.